Fruit & Flowers’ vocalist and guitarist, Ana, commented that the disproportionate gender skew has, “motivated her to be excellent all the time,” an attitude she likens similar to her professional experiences in the male-dominated tech industry. 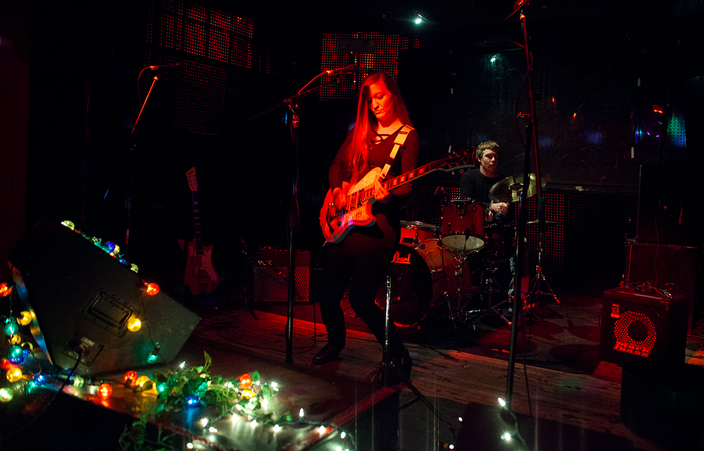 The all-girl lineup at The Barbary last week featured three new performers, cut from the fresh, female talent of the east coast underground. The bands – Red Queen Lilith, Fruit & Flowers and Sharkmuffin, all stylistically cross-over garage/grunge, glam, punk and the blues. Collectively, they represent a resurgence of female musicians who explore and innovate musical genres for female artists in the late 1970s and early 1980s, namely those associated with the secondary market. Thursday night's show was just one well-curated showcase of an up-and-coming girl-band revival, made possible by renewed interest in both the classic and second-wave forms of punk, surf rock, glam, and garage or grunge. When Madonna called the music industry “blatantly sexist” at the Billboard Women in Music Awards in early December, it inspired me to look into what potential opportunities are immediately available to an aspiring non-male musician. Advocates of equal opportunity in the entertainment industry sought to celebrate the female musician by leveling the playing field through genres that – in their essence – reject qualifiers and carry the spirit of defiance, like punk-rock. This was the form in which women like Joan Jett, Patti Smith and Siouxsie Sioux of Siouxsie and The Banshees, made their voice heard, and, in the long-term sphere of influence, negated sexism by being just as relevant historically and musically as any of their male peers, like, say, The Ramones or The Stooges. “Nothing makes me happier than playing Rock-n-Roll music. I am so thankful I get to do it,” she said. Fruit & Flowers’ vocalist and guitarist, Ana, commented that the disproportionate gender skew has, “motivated her to be excellent all the time,” an attitude she likens similar to her professional experiences in the male-dominated tech industry. She described this pressure as motivating, but not without stress. 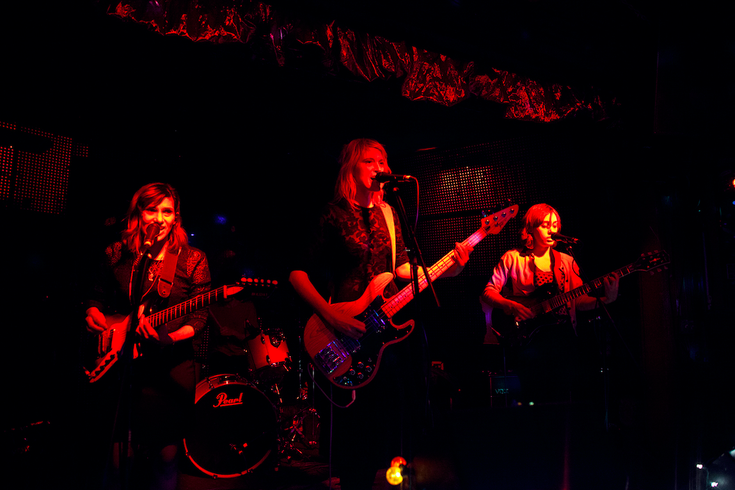 Headlining act, Sharkmuffin, consists of band members Tarra Theissen (guitar/vox), Natalie Kirch (bass/vox) and Davey Jones (drums). Think original, psychedelic rock meets noise-punk arrangements wild enough to fire up a mosh pit. Their performance showcased the trio’s stylistic, genre-blending versatility that highlight’s Theissen’s magnanimous garage-glam punk guitar compositions, appearance, and sound that the band has rightfully resurrected and cultivated. Lead vocalist and guitarist Theissen cited great influences from female predecessors like Courtney Love, while noting male influencers of guitar greats like Jack White. “There will always be that qualifier, no matter what… I may be the greatest guitarist in New York City, but I’ll only ever be recognized as the “greatest female guitarist in New York City,” she lamented. 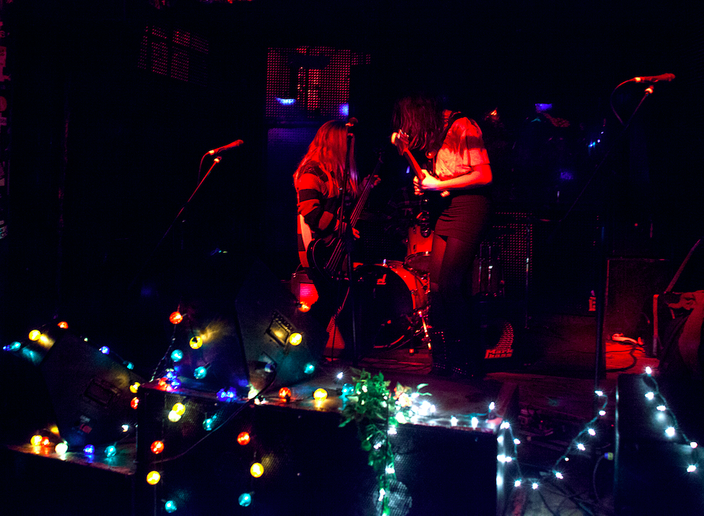 Fruit & Flowers and Sharkmuffin (both from New York City and who share a tour) and Red Queen Lilith are examples of bands led by young women who are creating work in the underground that channels all of the talent and presence necessary to crack the mainstream. They’re able to work within traditionally anti-gender binary musical forms that come to them intrinsically, and have a history of disrupting the system. Double Dementia is a creative producer and writer from Philadelphia.